Lord Butler was Cabinet Secretary between 1988 and 1998, working with two Conservative Prime Ministers - Margaret Thatcher and John Major - and, after Labour's 1997 landslide victory, Tony Blair. In this interview with historian Anthony Seldon, he talks about the bombing of the Grand Hotel, Brighton in 1984 and the IRA mortar attack on Downing Street in 1991. 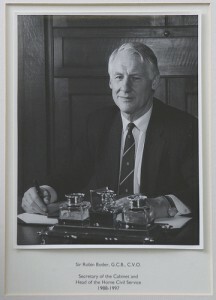 The Rt Hon Lord Butler of Brockwell, KG, GCB, CVO, PC entered the Civil Service in 1961. He was Cabinet Secretary and Head of the Home Civil Service from 1988 until 1998 during the Premierships of Margaret Thatcher, John Major and Tony Blair. He was Private Secretary to Edward Heath between 1972 and 1974, to Harold Wilson between 1974 and 1975, Principal Private Secretary to Margaret Thatcher between 1982 and 1985, and Second Permanent Secretary to the Treasury between 1985 and 1987.